The story is already written in my head. You’ll read it as soon as I get a chance to sit down and shape it into a word doc. This pile-of-clothes project requires every ounce of writing focus I can muster, and I welcome the effort with open arms. It’s a challenge I need. Check later for a story update. This one is going to be fun to write. Fanfic? Well, yes. That’s how it emerged from my noggin. Writing this story felt different from writing other stories. My focus wasn’t on the size goodies as much as the adventure I wish were a real episode. I love Doctor Who, I collect the series in any way I can, and I just ordered a sonic pen. It’s a pen, okay? Also, I’ve been waiting for the Doctor to be female since childhood. If you don’t like that change, let me know so I may visit your hometown and flatten it. So much to love here, Squid. As you know I’m a huge fan of Doctor Who in all its incarnations. Taedis is a typo I made typing out the name of the best damn Ship to ever be. I’ve been very excited at the casting of the series first (canon) female Doctor. I even wore a (purple) shirt that read “Nevertheless She Regenerated” during some of my casual time at the Con. And getting a little glimpse of what that will be like ahead of the new series airing is wonderful. Especially coming from a writer as talented as you, guest starring me, and featuring a size based theme. I’m not convinced this is the Whittaker incarnation of the Doctor though. A part of me hopes that you cast yourself in the role. It’s easier now that the whole gender thing isn’t an issue. I rather love the idea of traveling through time and space as your tiny companion. 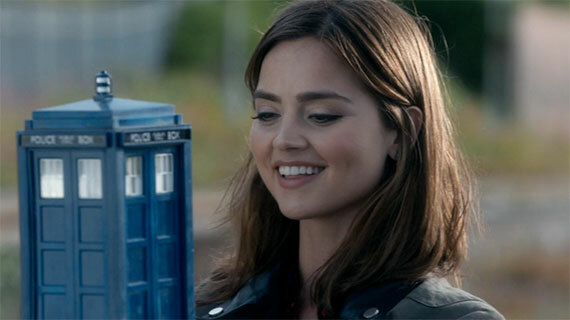 And I have some theories about where the Doctor could keep me in between adventures. Maybe she found that old miniaturized control room the Master used after his Tissue Compression Eliminator had some issues. Maybe she could mess with the dimensional controls for part of the TARDIS so I could have a normal-isn environment to rest in. Or the force field could fail and the doors open shrinking the Tardis and her down to my size like they did in an English garden back in 1966. We could have an adventure trying to figure out how to return to normal with me hoping she can’t quite figure out how to fix me as well. Of course, I’ll be happy just hanging out in her pocket beside her sonic screwd … pen with a couple jelly babies to keep my company. The outfit reminded me of Tegan. Mostly the combination purple skirt and off white blouse look she rocked when she took her jacket off in her first season. It wasn’t tartan, but she could have modified it after finding one of Jamie’s spare kilts. And I think I dimly remember Jo sporting a pair of boots like the ones you describe. If not, Polly would have made them work. And thank you for the brooch. Thank you for all of this, Squid. Thank you, Taedis. I know you are a huge fan, even bigger than me because there are some things about the old Doctor Who incarnations that really bug me… but never mind that. I have wanted to see a female Doctor for as long as I can remember, so this is a dream come true. I’m not even going to complain that the actor cast is not unusual looking as previous doctors have been, but downright pretty. The idea of the Doctor having a tiny companion is one I’ve fantasized about for years. It will never come true because a tiny companion is such high maintenance, but damn, it sure would be wonderful! I don’t know about Jelly Babies, but surely a Jammie Dodger would always be at hand. The outfit came out of my head as something I would love to see a man wear. People don’t crossdress often enough, and in the end, gorgeous clothes are gorgeous clothes, no matter who’s wearing them. Speaking of which, I’m only mildly enthusiastic about the Thirteenth Doctor’s outfit. I don’t like the trousers. I always love a long coat and walking boots, and I’m nuts about suspenders, but the pants could have been ten times more awesome. Oh well, all the easier for me to reproduce it for myself, though my favorite costume (not my favorite Doctor) will always be Tom Baker’s Doctor​. And wrecks their spine (under normal gravity). Though when I was in my teens I wore 4-inch heels everyday, and never paid for it. I was lucky. I think we’re making a good case for sonic heels. Don’t ask me how they work, they just make slightly more sense than sonic sunglasses. And the Babel Cloth was genius. Thank you! I’ve always loved the Babel Fish and psychic translators. I thought both concepts would play well when dressing up a tiny companion. That’s a great idea. And the wearer can run in them too.